What Happened to Her Inside the Elevator Took Her Life! 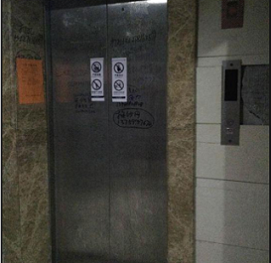 A Chinese woman died of thirst after being trapped in an elevator for a month because maintenance workers shut off the power supply and failed to properly check if anyone was inside. Workers came to repair a malfunctioning elevator in the northern city of Xi'an in late January. The power was switched off to the elevator, which was stuck between the 10th and 11th floors. The workmen left for the New Year holiday, returning at the start of March to find the body and desperate scratch marks on the inside of the lift. According to reports in China, the incident was due to a serious error caused by the maintenance company for not opening the lift before cutting off the power, and not verifying whether there was anyone inside after the power was off. The deceased woman, aged 43, reportedly lived alone in the building. One of the residents said that according to the paramedics, when they found the body her hand had already begun to deform. “There were markings all over the inside of the elevator, it’s just too horrible,” she added. Another resident said the victim probably starved to death while inside the elevator. The case has been classified as a negligent homicide, and at least, one “responsible person” has been imprisoned in connection with the investigation. China is one of the countries which are prone to safety accidents as regulations and standards are often disobeyed and lack of enforcement. The event revived memories of a tragic escalator death last July which was also related to maintenance issues.